The new ‘midi-paver’ will be used extensively in the coming year when numerous rural roads will be improved as part of the 2019 programme of works. A state-of-the-art piece of custom-built surfacing plant is joining the Island Roads’ resurfacing fleet. 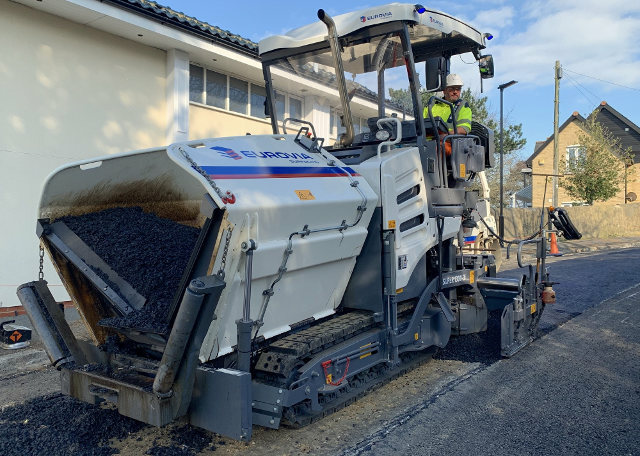 The new ‘midi-paver’ is a specialist in resurfacing narrow roads and will be used extensively in the coming year when numerous rural roads will be improved as part of the 2019 programme of works. “This year will see much attention paid to rural and residential sections of highway which are typically narrower. The vehicle boasts a series of safety, security and efficiency features making it what is thought to be the most advanced vehicle of its type operating in the UK. Hi-tech features include technology enabling its performance to be monitored remotely and in real time and also allowing its whereabouts to be tracked. 4 Comments on "New specialist vehicle will help resurfacing of narrow Isle of Wight roads"
Will they then have time to use one of the larger machines to repair the roads they have already bodged like the sections of Landguard road/sandy lane and the High Street and also the patches they have attempted to refill going towards Winchester House. I expect they may now finish Brook Road started a year plus but given up on. Along with quite a few other main roads that were ‘done’ last year that the surface is already breaking up. That tracking feature will be especially useful if they forget where they parked it! Probably find it hasn’t moved for a month. I wonder if there will be an app where we can monitor it! !